Hi, Veronica here today for my first post with Leaky Shed!! 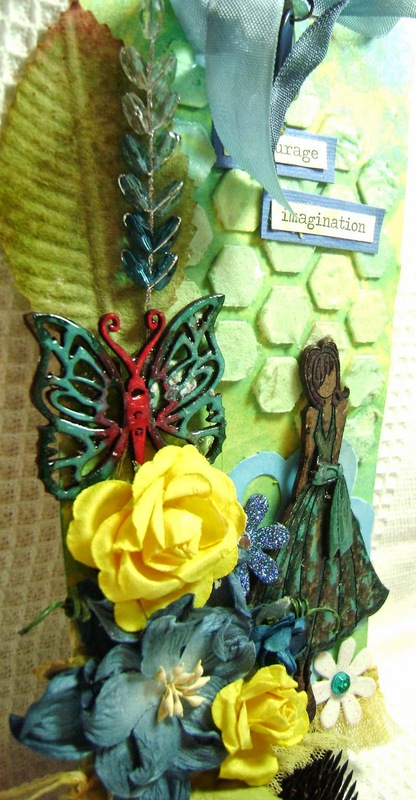 I am so excited to be here and share with you my sweet tag using Leaky Shed's awesome Butterflies and Julie Nutting Chipboard Doll. I love making tags because they are little pieces of art. 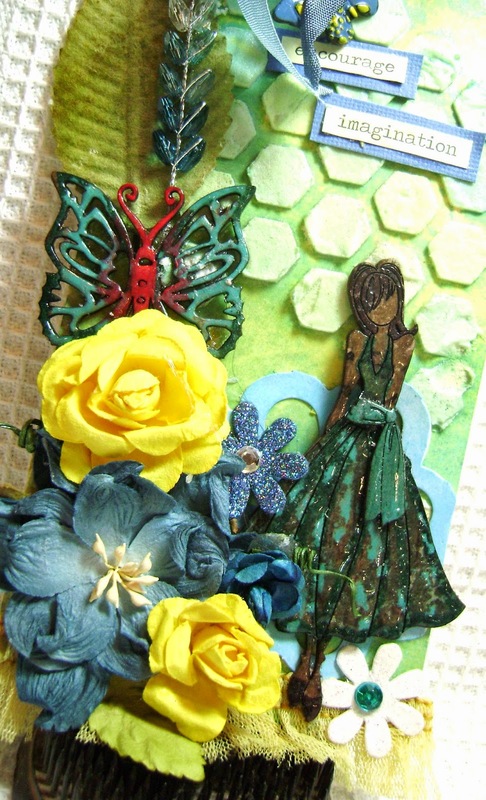 Besides trading your little beauties you can also place them on a layout or album. I have some of my tags framed so that they become Home Décor for your studio or any room in your home. You can even use them to decorate a present to a special person. 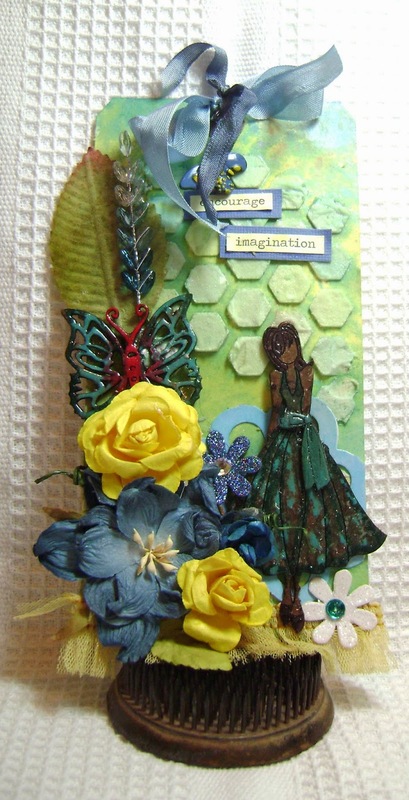 Since the butterfly and Julie Nutting doll were the center pieces of my tag I wanted to alter those pieces first. My first step was to prime my chipboard with a base white paint. After I heat set the base color I then colored the butterfly with alcohol inks. 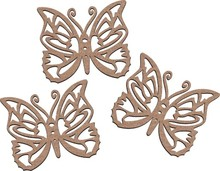 Lastly I embossed the whole butterfly with clear thick embossing powder. 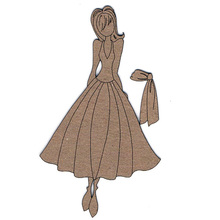 For the Julie Nutting doll my first step was to stamp the chipboard with a script stamp using stazon ink. I then colored in her hair, shoes, skin and the outline of her dress with alcohol inks; the alcohol inks dried very quickly. 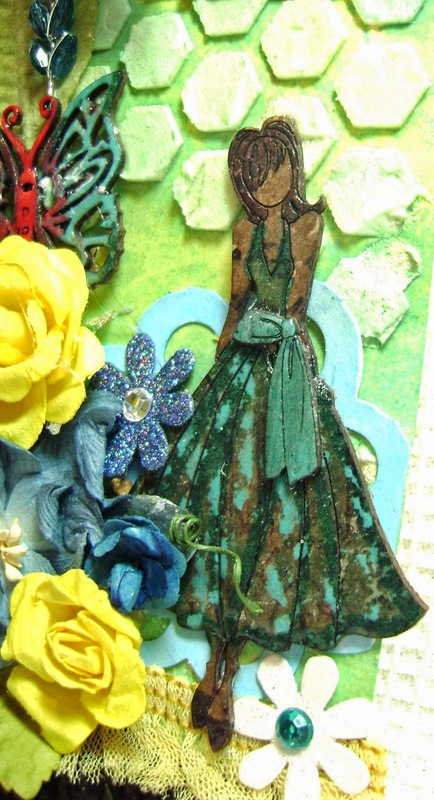 I then used turquoise paint for the folds of her dress to give it a sort of pattern. After I heat set the paint I embossed the entire chipboard with triple thick clear embossing powder. 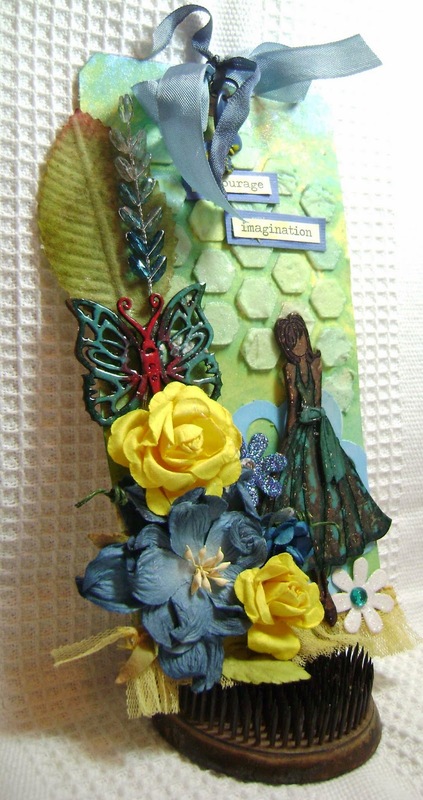 I then created the background to highlight the chipboard pieces. First I inked and spray misted the tag then used a stencil and molding paste for more texture. After it dried I started layering leaves, diecut paper, flowers and ribbon. I hope you enjoyed my tag as much as I enjoyed sharing and creating it for you. 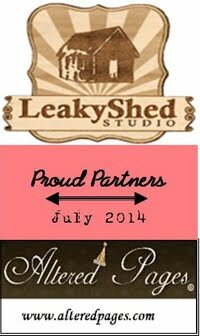 Thank you for stopping by and I can't wait till it's my turn again to feature my next Leaky Shed project! So gorgeous! LOVING the colors!!!! !